Battle Rope station on each leg. Elegant solution for attachment of our blackthorn battle ropes. Premium, powder-coated steel construction, made in Germany. 230 cm total height. Unique attachment swivel that rotates on all axles and contains a sliding bearing. Also available as wall install. No wall requirements – works everywhere. 2 rail adjust and one battle rope station. 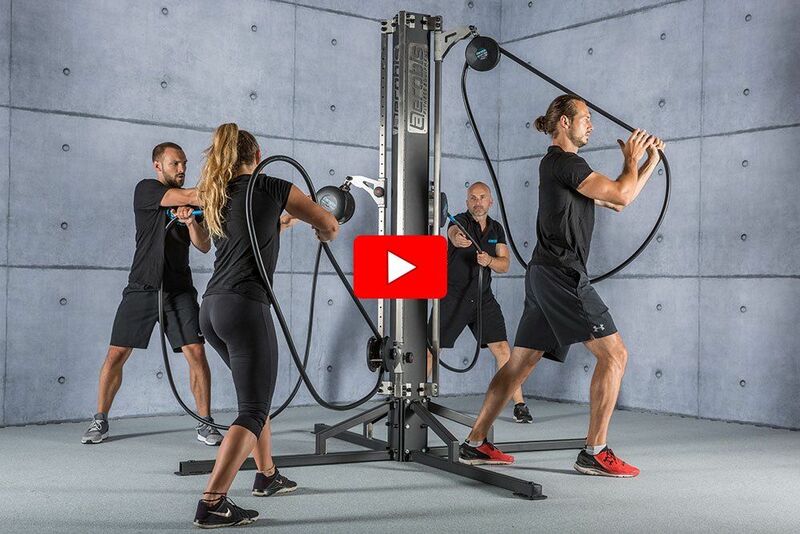 The verso360 Tower enables a perfect endless rope training experience for 2-4 athletes (additionally for battle ropes) with height-adjustable suspension. Excl. training equipment. Due to its space-efficient design the verso360 Tower 4 requires only 5 sqm floor space. With a height of 230 cm it fits into any training facility and offer functional group training anywhere. The attachment for the training devices was concepted in order to avoid a quick removal. This ensures the stay of the training devices in your facility.